Simon Stephens is a household name in German theatre. His mix of realism, a heightened language close to poetry and his focus on dark material makes him a very interesting playwright to import into German theatre culture. Simon has also built up a very strong relationship with the German director Sebastian Nübling over the years, describing the director’s approach to deconstructing his plays as very inspiring and liberating. With the opening production for HOME, it was my intention to work in the reverse way – to import a lesser-known European author to the Manchester theatre scene by matching Horváth with one of the most acclaimed and controversial playwrights of the United Kingdom, Simon Stephens. Another factor in approaching Simon is the fact that he is from Manchester, so his knowledge of the city would be very helpful when we commissioned a new version of a play that was originally written over eighty years ago and set in Munich’s Oktoberfest as our opening piece. The intention was clear to stage a play which would have to resonate with the city of Manchester. 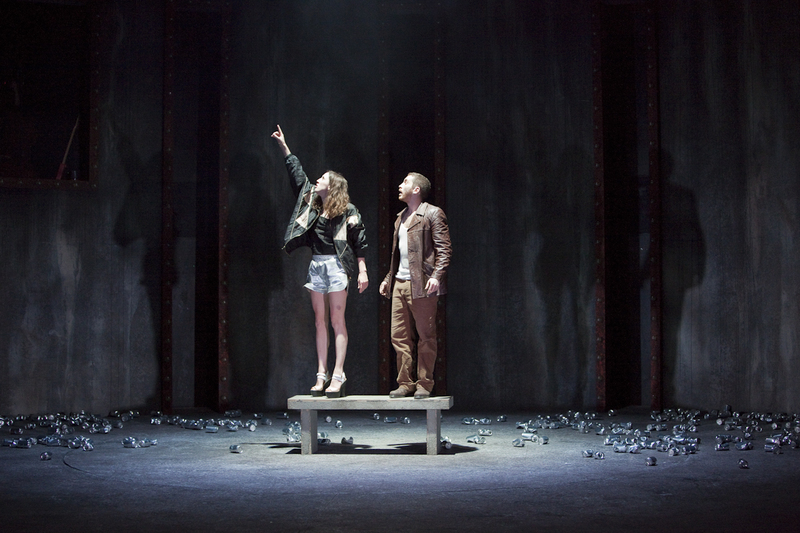 Katie Moore (Caroline) and Ben Batt (Cash) in The Funfair, adapted from Ödön von Horváth’s Kasimir and Karoline by Simon Stephens, directed by Walter Meierjohann. Presented by HOME Manchester (14 May – 13 June 2015). Photo by Graeme Cooper. I contacted Simon at the beginning of June 2013 to discuss whether he would be interested in adapting Ödön von Horváth’s Kasimir und Karoline for our opening season at HOME. I have always wanted to stage this piece, especially after the banking crisis in 2008. With its focus on a young couple, this play talks about youth unemployment (Kasimir has been made unemployed the day before the play’s action starts), the economic pressures all people from society are under, and how wealth or poverty deeply affect human behaviour. Money rules at the funfair in 1929, the ugly side of capitalism is described, but, like all great playwrights, Horváth injects a lot of irony and ambiguity into his scenes, the biggest irony perhaps being the contrast between a belief in the future (represented by the zeppelin which circles the funfair) and the freakshow, in which so-called freaks are exploited to show their so-called abnormalities (in many cases disabilities) to a paying audience. In both cases, Horváth looks at the crowd and portrays them as observers in the first case, voyeurs in the second. 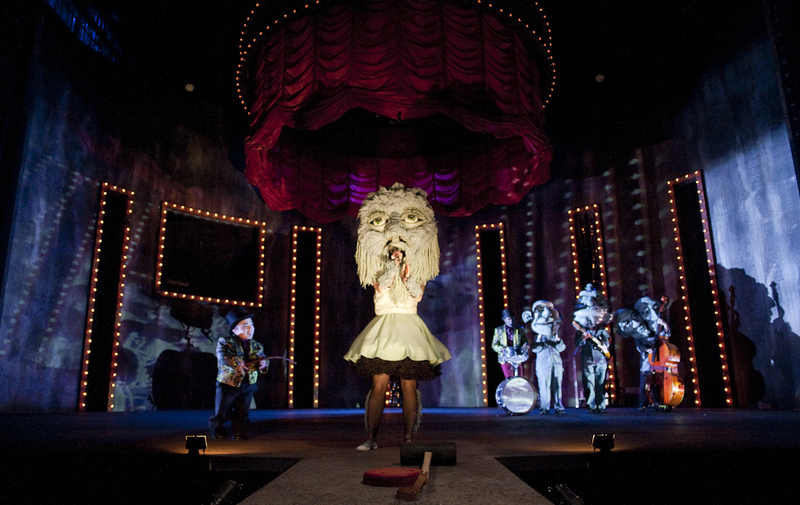 James Lusted (Tiny), CiCi Howells (Juanita), and the company in The Funfair, presented by HOME Manchester. Photo by Graeme Cooper. In my first meeting with Simon, I was very pleased to hear that he knew of Horváth and of Kasimir und Karoline. There had been some stagings of Horváth’s plays in London, but I am still very aware that many artists working in British theatre have never come across this very important contemporary of Brecht. Simon did not only know Kasimir und Karoline, he adored it and said it was in his early years as a playwright that the then literary manager at the Manchester Royal Exchange, Sarah Frankcom, now its artistic director, gave him the play to read, and he said it changed his idea of playwriting. Also, three weeks before we opened The Funfair, Simon gave an interview in which he said that he saw a strong link between Horváth and Manchester writing traditions, jokingly calling Horváth the forefather of great Mancunian playwrights. I was completely unaware of this when I contacted him. I did, however, sense a strong link between Simon Stephens’s and Horváth’s work: both have a particular sparseness in their writing, characters never say an unnecessary word, there is a strong sense of heightened language, which makes their plays both very believable but also very constructed, both Horváth and Simon very often talk about outsiders of society, often their characters are working class – and Horváth suggests that all his plays have to be unheimlich (uncanny) to have real impact and also to make them deeply funny. 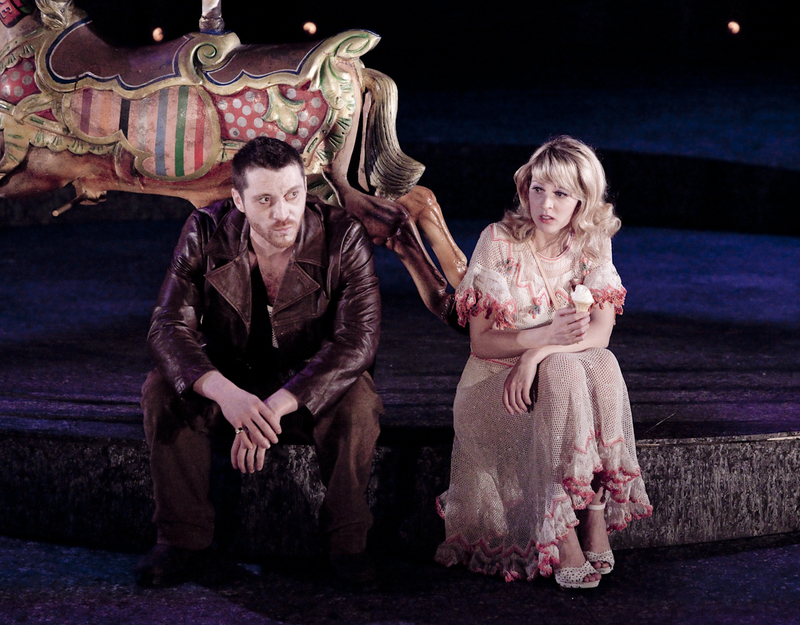 Victoria Gee (Esther) and Ben Batt (Cash) in The Funfair, presented by HOME Manchester. Photo by Graeme Cooper. Horvath, like Brecht, wrote in an anti-naturalistic fashion and his characters are very often stock characters. He was less interested in the characters’ psychology, but more interested in how language was used by characters in a way that made them unaware of what they were actually saying. The mass media’s effect on language was one of Horváth’s key interests. Although this applies to all societies in the 1920s and 1930s, Horváth created a KUNSTSTPRACHE (an artificial language) which is sometimes very hard to translate. His focus on a BILDUNGSJARGON (an ‘educated jargon’: characters of provincial Bavarian origin trying to speak in High German to sound higher-class) is untranslatable in English. Simon’s characters spoke with a regional accent (Mancunian), something Horváth strictly did not want for the German production of Kasimir und Karoline. But by setting the piece in the North, we were able to tap into a working class culture, a culture of drinking, and also to make references to the North-South divide (the role of Spear was performed by an actor from London). Our approach in adapting the piece was that Simon was actually quite faithful to the original; we did change Munich to Manchester (with Frankie Marr coming from Liverpool and Jonny Chase from North Wales as visitors to the funfair), but we were not specific about which part of Manchester. Simon updated the text by letting the characters swear more than in the original, but we were very clear that although we wanted to talk about today, we did not want to set the piece in a specific era. Simon and I loved Horváth’s poetic offerings: a funfair, a zeppelin, a freakshow. We kept them in and thereby created a textual framework which allowed references to the past and the present clash or enhance each other. The costumes were more inspired by the 1970s, the music (we followed fifty per cent of Simon’s suggested songs) was a real mix of 1950s, 1960s and 1970s, as well as some music of today – again, a very eclectic mix which gave the piece a timeless feeling. Musicians Max Runham and Barbara Hockaday, and James Lusted (Tiny) in The Funfair, presented by HOME Manchester. Photo by Graeme Cooper. The one big change I asked Simon to make was to create the role of the narrator, performed by an actor of reduced height who also played the role of Tiny, the capitalist owner of the freakshow. This method of introducing scenes and commenting on other characters gave the piece a more epic feeling, in the Brechtian sense of the word, which sat well with Horváth’s expansive, epic scene structure, comparable to a revue form in a cabaret. Simon had wanted to write a piece about the rise of UKIP for some time, but did not manage to find a way to do it. He said that by adapting Kasimir und Karoline, he managed to do exactly that. Some of Kasimir’s/Cash’s lines, blaming foreigners for his unemployment, are UKIP jargon, and I believe Simon succeeded triumphantly in capturing the dark, uncanny mood of Horváth’s original which was, of course, a prophecy of what was to come in Nazi Germany. Here in the UK, the mood of anxiety and xenophobia has also increased since the crash of 2008 – and Simon’s version made it a very political, but also very funny piece for our times. 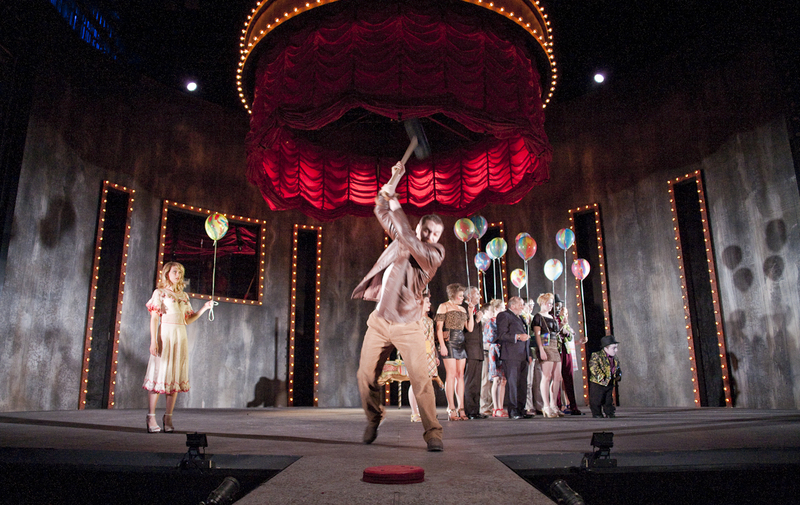 Katie Moore (Caroline), Ben Batt (Cash), and the company in The Funfair adapted from Ödön von Horváth’s Kasimir and Karoline by Simon Stephens, directed by Walter Meierjohann. Presented by HOME Manchester (14 May – 13 June 2015). Photo by Graeme Cooper. Walter Meierjohann is the Artistic Director of Theatre for HOME, the centre for international contemporary arts, theatre and film based in Manchester, which was formed by the merger of Cornerhouse and the Library Theatre Company. He is also an established theatre director who has worked extensively in Germany and the UK. In 2004 Walter joined the State Theatre of Dresden as founder and Artistic Director of NEUBAU, and he joined the Young Vic in 2007 as International Associate Director. 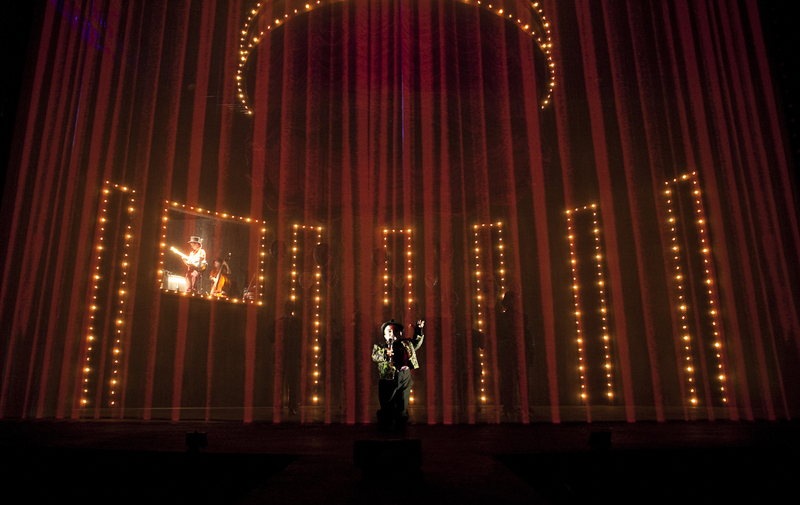 Walter has also directed at The Barbican, the Nottingham Playhouse, and The Curve.